It's been more than a year since I've seen Spec Ops: The Line. In fact, I'm one of the few people to have played Spec Ops, back at a pre-E3 event in Los Angeles in 2010. It was an unofficial session, as previews were limited to eyes-on impressions, so I won't go into too much detail about it. But even then, it was clear that Spec Ops: The Line had a long way to go. Now, 18 months later, I've played more than an hour of a Spec Ops that feels solid and functional -- current, even. But now that The Line seems well on its way to relevancy as a game, developer Yager faces what might be an even bigger obstacle. In a quest for a literary sort of statement and message, Spec Ops: The Line has the baggage of the entire medium to overcome. That isn't to say Spec Ops is in a bad position as it stands now. The delay has done The Line good. In that time, Yager has retooled the engine to support the enhancements seen in Unreal Engine 3 in the last year, particularly obvious in the new lighting system. Spec Ops is striking in ways it wasn't before, its desert landscape full of vibrant blues and reds and purples in addition to the expected oranges and yellows. More importantly, Spec Ops: The Line has solid design chops. It's uncommon for a developer to let a member of the press play for as uninterrupted a stretch as Yager allowed me last week. Even more unusual is the breadth of what I played, which included significant portions selected from the first half of the game. There was a clear confidence on display. I can understand why. I played through one well designed combat scenario after another, each with an interesting layout that offered numerous tactical options. 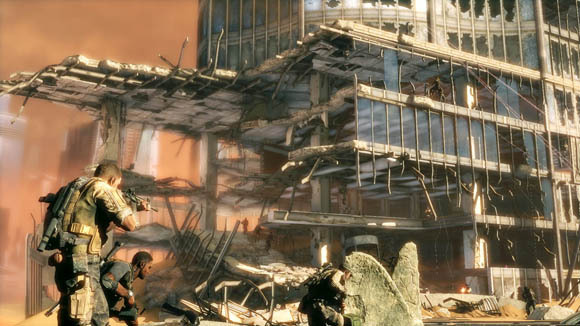 The setting of Spec Ops: The Line's sandstorm-swept Dubai offers numerous possiblities. There was an emphasis on varying levels of verticality in many of the sections I played through, with enemies often attacking with superior fields of fire and placement. The constant threat of a shifting environment was also omnipresent, whether in the form of a bus full of sand whose windows could be shot out, burying the opposition, or a crumbling floor underneath the player-controlled Captain Walker. It leaves him and his team hanging for dear life, shooting one-handed at swarms of enemy combatants below. 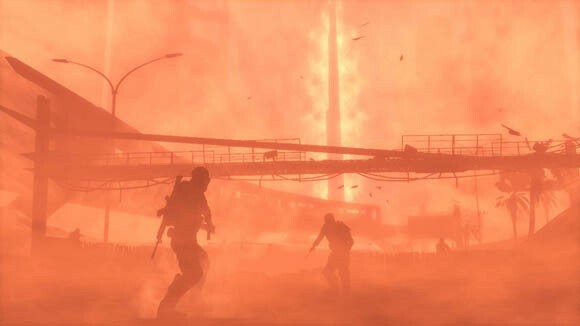 From what I've played, Yager is doing a good job of keeping Spec Ops: The Line interesting to play moment-to-moment. Shooting is also nailing the difficult-to-quantify feel quotient. The guns are fun to use, and enemies go down how you'd expect based on the weapons present. In fact, Spec Ops is so tight at this point that the biggest question mark at this stage isn't how it plays. Instead, I wonder about the subject matter it deals with, and the message it hints at exploring. Yager has already gone on record citing Joseph Conrad's Heart of Darkness as the literary inspiration for Spec Ops: The Line -- the mad general antagonist of The Line, John Konrad, is named for the novel's author, and the story loosely mirrors the premise of Conrad's book. Heart of Darkness explored the atrocities of men removed from the influence of civilization, and Spec Ops seems poised to cover similar ground. 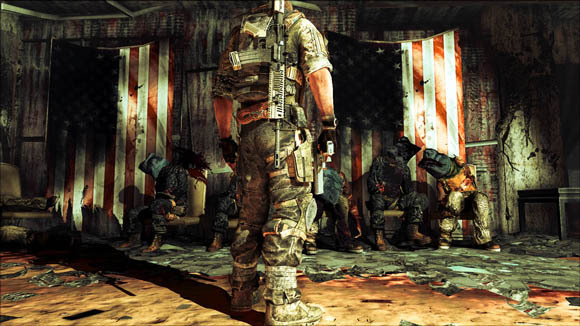 While Spec Ops is a shooter, there's a marked lack of the sort of gung-ho machismo that marks the genre elsewhere. Firefights in The Line are bloody, messy, and often desperate (which currently carries over to The Line's difficulty, which allowed for little margin for error in my time with it). There's also a lingering focus on the human cost of violence. 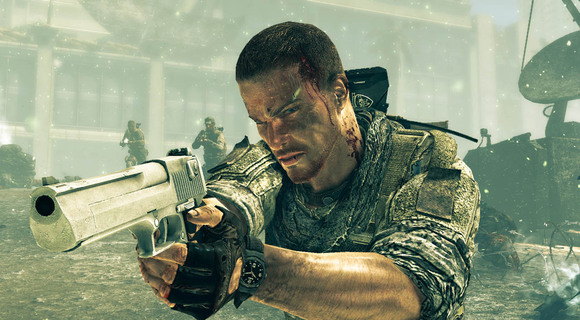 Civilian death and non-combat fatalities are all around in Spec Ops. The Line lingers on some fairly horrific imagery in ways that other war games have avoided. It's clear that the story of Spec Ops focuses at least in part on the madness of Konrad and the atrocities commited by the 33rd in his name, in the name of order, but I didn't have enough of a chance to get a solid grasp on how it's going to be handled. Thus far it doesn't feel exploitative. It's not "No Russian," or a contrived American vacation in the UK a la Modern Warfare 3. But there is one moment in particular indicative of the struggles that Yager is facing to make a game that deals not just with "mature" subject matter, but serious, literary messages. The moment in question sees Walker and his team stumble into what looks like a high-rise upper floor lobby, full of shot, burned, and mutilated corpses. The characters' reaction to that horror is tonally consistent, to be sure, and there's no pounding metal or techno to disrupt the moment. But there is a flashing clipboard collectible on a table in the room's midpoint, which serves to break immersion in that moment completely. A representative from Yager was quick to explain why that clipboard was there, as it went into some detail as to what precisely had happened in that lobby. But the damage had already been done, as a now common convention of modern shooters, the collectible, had served to undermine the otherwise impeccably presented moment of solemn horror. Then there's the moment of moral choice presented later in my time with Spec Ops: The Line. As Walker and his team come upon a pair of men fitted with nooses, it becomes apparent that it's an ambush, with 33rd snipers in the distance and Konrad on the radio. You're presented with a choice: kill a civilian who had stolen water, or kill the soldier who had murdered that civilian's entire family in retaliation. Forced to make a choice, I killed the soldier, and watched the ambush unfold moments later regardless. But in speaking with some of the team afterwards, it was suggested that there were many more options available in that situation than it initially seemed -- I could have refused to act, or ordered my team to take out the snipers that flanked us. The problem is the baggage Spec Ops: The Line carries as a game, and as a shooter in particular. Unfortunately, the onus is on Yager to develop a relationship with the player that suggests that decisions go beyond binary choices, countermanding years of forced "moral" decisions in other games. I'm not saying the necessary work isn't there to foster that kind of player understanding. I just didn't see any in my time with The Line. At this late stage, Yager has got the game part down. But I can't tell yet if their message will come through. Spec Ops' very nature as a game might serve as its own worst enemy in Yager's efforts to achieve something meaningful with its narrative. It's not the worst situation to be in. But Yager's success in walking that tightrope could determine where Spec Ops: The Line falls in the spectrum between "good" and "memorable."